Along with my sons, I am now also raising my three year old granddaughter. I had thought I wasn't up to the task of starting over, the task of raising a small child, but I was soon shown differently. Because it isn't a task. Its not a chore. Raising a child is a journey filled with love and learning. My boys are older. Chris, the eldest, is twenty three now. Eric is twenty and Mark; sixteen. Chris has Aspergers and Eric has severe Autism. Its a noisy, active, interesting household. Its also quite easy to get caught up in the challenges we face. 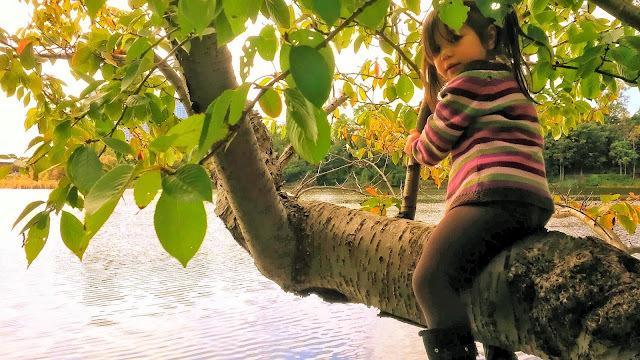 Having a three year old around forces me to stay grounded in reality, while at the same time appreciating the wonder around me. Samantha is a very bright little girl, and shocks us constantly. But the thing that surprises me most, and most often, is her ability to connect to, and communicate with, my severely autistic son. Mark also possessed this trait when he was small. Eric had no speech at the time, yet Mark could interpret Eric's screams, grunts and body language. I often turned to my two or three year old Mark for 'translation'. He has grown into an extremely compassionate young man. I think Samantha is on the same path. Although Eric has some speech now, it is mainly delayed echolalia. He has sort of tape recordings of phrases from movies in his head, and when he wants to communicate a need, he uses the 'recording' that fits the emotion or need. For example, ' Stampede, in the gorge, Simba's down there' (ala Scar from Lion King) means Eric is afraid or anxious. Samantha translates all of these with ease, even without knowing the context. She can engage Eric in play, a rare thing for Eric. Its quite the sight to have a three year old pig-tailed little girl growling and chasing a 200+ lb twenty year old man all over the house, only to catch him and tickle him into fits of hysterical laughter. And put huge smiles on Mom/Nana's face! Eric has severe anxiety disorder, and has been hospitalized several times in the last two years. Somehow, over that time, Samantha has picked up the cues to his escalating anxiety, and mimics my strategies to help him. I can be in the kitchen preparing dinner when I hear my little three year old darling asking her uncle if he needs 'pressure' (deep compression therapy which aides in de-escalating the anxiety) or medicine. I've seen Samantha ecstatic when Eric utters a new word, or master a new skill, and incredibly I've even seen her teaching Eric skills. As much as she helps and teaches Eric, she is my little teacher as well! At the times when I find myself overwhelmed with the challenges of an Autistic household, along will come little Samantha. She has a way of seeing through the chaos and saying, or doing, just the right thing. A little comedian, with a bit of drama-queen thrown in, she teaches me daily not to take myself, or life, too seriously. She teaches me that life is a ride, and rides are meant to be enjoyed. Sometimes the track is bumpy, and often we are scared when we can't see around the corner, but it is still a ride. If you are determined NOT to like it, you won't. But surrender yourself to the thrills and chills and you will soon find its enjoyable after all. The littlest teacher shares that lesson with me each and every day. Not a task. Not a chore. Just a beautiful, wonderful ride.